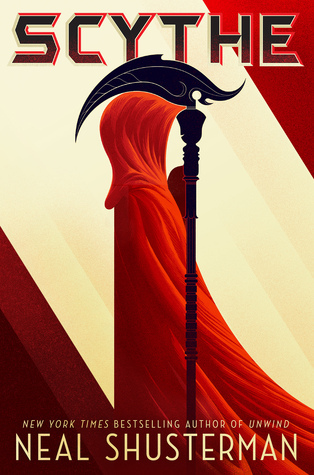 Read a full summary of Scythe by Neal Shusterman below. If you can’t remember what happened in Scythe and you need a refresher, then you’re in the right place. This recap was written by Charlie. In a future where people don’t die of natural causes anymore, a group of people called Scythes have been established. It’s their task to kill a certain amount of people so that the world won’t be overpulated. Two teenagers named Citra and Rowan are taken on as apprentices and are forced to compete against each other by Scythe Goddard who abuses his powers and enjoys killing. Rowan trains with Goddard and learns about his plans and his cruel, manipulative character and ends up killing him and his associates. Citra wins the competition and is supposed to kill Rowan when she is appointed a Scythe. Instead she helps him flee as they both love each other. By the end of the book it’s hinted that Rowan has become a vigilante Scythe, killing other ones like Goddard, while Citra is working to help system from the inside. The story is set about three hundred years in the future. Governments don’t exist anymore. Instead the world is governed by an artificial intelligence called the Thunderhead which knows and sees everything, stores the world’s knowledge and provides people with what they need for living. People don’t really die anymore. Diseases do no longer exist and when someone is killed by accident, suicide or a crime (which barely exist anymore as the Thunderhead sees everything) they are revived. Only with fire it is still possible to kill someone permanently. When people grow old they are able to make themselves younger with 21 being the youngest age possible. People’s bodies are also manipulated by something called nanites. They have painkilling and healing nanites and emo nanites who control their emotions and for example keep them from getting too angry. All of these nanites can be turned off with a tweaker. To keep the world from being overpopulated the Scythes have been established. They are humans trained in killcraft and it’s their job to kill (referred to as “glean”) a certain number of people permanently each year. They are the only group of people not controlled by the Thunderhead. Instead they have their own democratic form of organising and making decisions. The Thunderhead is also not allowed to watch them or store data about them. Scythes are also able to give immunity from being gleaned to people by letting them kiss their ring (Every Scythe wears one). The ring then stores the DNA of the person and signals to every Scythe they meet that this person has immunity. Scythe have rules by which they glean. They are not allowed to glean based on biases (e.g. ethnic ones) and they have to glean a certain number of people in a certain amount of time. When they glean a person their immediate family (usually the people living with them) are granted immunity for a year. When a new person is appointed Scythe their whole family gets immunity for as long as the Scythe lives. Scythes can be recognised by their robes the colour of which they chose themselves, though black robes are not usually used. They also give up their real name and choose a Patron Historic (a famous historical person) to be named after. The story centres around Rowan Damisch and Citra Terranova, two 16-year-olds from MidMerica. They separately meet a Scythe named Faraday when he comes to glean people acquainted to the teens. Faraday takes a liking in the two of them as they’re both sceptical towards his job and show a lot of empathy. He decides to take them both on as apprentices and chose one of them to be a Scythe after a year of training. Although both Citra and Rowan are reluctant at first and don’t want to become Scythes – which, as Faraday says, is a requirement for becoming one – they turn out to be good apprentices. They learn to handle lots of different weapons, learn about poisons and have training in a martial art called Bokator. They also accompany Faraday to his gleanings and learn that he chooses the people to be gleaned after statistics on how and why people died in the Age of Mortality. Although they don’t admit it Rowan ans Citra also take a liking in each other. Meanwhile highly controrversal Scythe named Goddard and his associates Chomsky, Volta and Rand are known for spectacular and rather brutal mass-gleanings. From his gleaning journal (which every Scythe is required to write) we learn that Goddard enjoys gleaning and has big plans for the Scythedom. Some Scythes, including Faraday, don’t like how Goddard does his job, especially as no Scythe should enjoy killing. In an assembly of the Scythes Goddard criticises that Faraday took on two apprenticed and proposes a competition: Whoever of the two gets appointed Scythe should glean the other one. Faraday objects but as Goddard blackmails the High Blade Xenocrates by taking his illegitimate daughter Esme hostage, the competition is accepted. To save Rowan and Citra Faraday apparently gleans himself by jumping in front of a train as the apprentices of a Scythe who dies are usually freed. However Goddard proposes to take on the teens and Scythe Curie intervenes, taking on Citra as her own apprentice. Rowan and Citra are separated but the competition still goes on. Scythe Curie, nicknamed the Grand Dame of Death and famous for gleaning the last president and his cabinet, has a very different method of gleaning. She searches for people who look as if they’re stuck in their life – stagnant, as Curie calls it – and gleans them without prior warning. After some time Citra starts liking Curie as much as she liked Faraday and even learns her real name, Susan. While working with her, Citra secretly does some research on Faraday’s death as she suspects that Goddard killed him. With the help of the Thunderhead and its backend she finds that the day Faraday allegedly jumped in front of a train, some witnesses were bribed with immunity. Meanwhile Rowan is trained to be a killing machine, training with real people (who get revived after he killed them) and being forced to accompany Goddard and his people to their mass gleanings. Goddard also turns of Rowan’s painkilling nanites and starts the training with Rowan being severely beaten by Volta, Rand and Chomsky. Rowan doesn’t approve of Goddard’s methods and tries to save as many people as possible at the gleanings but still finds himself fascinated by the man. At another Scythe’s assembly Citra and Rowan meet again. She tells him of her suspicions about Faraday’s death. As a apprentices’ test they have to fight a hand-to-hand combat where both try to make it look like the other person overpowers them. Rowan, who can’t stand the thought of gleaning Citra, tries to make her hate him so that she will have it easier to glean him at the end of their competition. To pretend he has changed into a killer like Goddard he breaks Citra’s neck during the fight. When Goddard finds out that Citra suspects him to be Faraday’s murderer he frames Citra for the crime. She escapes by jumping from a rooftop. While in coma when being revived she suddenly has a connection to the Thunderhead who talks to her, telling her it can’t help her as it as promised not to intervene in the Scythe’s affairs. When Citra is revived Scythe Curie helps her to escape and tells her to look for a Gerald van der Gans. Curie takes Citra to another continent (the former South America) where the MidMerican Scythedom has no power. While Citra travels the continent, looking for van der Gans, Curie tries to clear her name as the “evidence” written by Faraday in his diary about Citra is actually about Curie. She was once Faraday’s apprentice and later had a love affair with him for which they were severely punished as its forbidden for Scythes. Citra finds van der Gans, realising he is actually Faraday who only faked his death to free Citra and Rowan. She tells Faraday what happened with Goddard and travels back to MidMerica in time for the next assembly where she and Rowan are to be tested for the last time. Meanwhile Rowan grows close to Alessandro Volta who seems to be disgusted by Goddard’s methods as well but doesn’t find the power to leave him. At another mass gleaning at a Tonist cult (people who worship the great tuning fork) Volta kills a bunch of school children and, not being able to live with his guilt, gleans himself by slashing his wrists. He dies in Rowan‘s ams. Rowan then goes to find Goddard and kills him as well as Rand and Chomsky. He then burns the church to the ground so that the Scythes cannot be revived. When the news reach the rest of the Scythes some of them suspect Rowan to be a murderer but High Blase Xenocrates decides to call off the investigation in exchange for Rowan keeping the secret of his illegitimate daughter. In their last test the Scythe apprentices are supposed to kill a family member (who is to be revived afterwards) so that they will already have done the worst things they will ever do in their life. While Rowan kills his mother without hesitating Citra struggles with killing her little brother but eventually does it. Citra ends up winning the competition with Rowan and being appointed Scythe. She chooses the name of Anastasia, the last Romanow princess, who lost her life early just as Citra almost did. When she is supposed to glean Rowan she slaps him in the face “for breaking her neck”, cutting his cheek and transmitting his DNA to her ring so that he will get immunity for a year. She then gives Rowan the opportunity to flee. Faraday waits outside the building with a car to take Rowan away. he book ends with an entry in Citra’s gleaning journal saying that there is a rogue Scythe nicknamed Lucifer who started killing Scythes who abused their powers with fire, just like Rowan did with Goddard. There is also a hint for a possible story for book two: In his journal the very first World Supreme Blade Prometheus talks of an opportunity for when the “experiment Scythe” fails. It’s a greate summery but at the end, she doesn’t slap him, she punches him. Also, in which page is this entry from Prometheus? And, does anyone know if there is another book, not the Thunderhead which refers to well, the Thunderhed, but something that talks about what happens to Rowan and Citra. I just fell in love with them and want to read more! I like The Arc of a Scythe series. I can hardly wait for the next book.